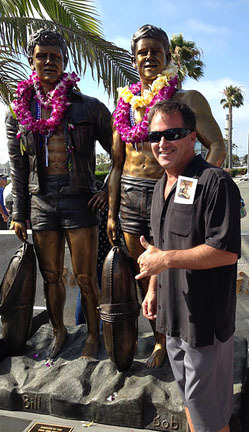 Chris Barela is a world-renown bronze sculptor who is best known for ability to create life like sculptures of marine life. All of his sculptures are original works of art, some are customized to meet client's needs and some are designed to be sold as limited edition in galleries worldwide. Our top priority is making sure that every sculpture that leaves the Barela Studio & the foundry is a masterpiece. Our collectors are astounded by the quality and craftsmanship that goes into each piece. We hope you find the sculpture you're looking for. Chris Barela’s love for the water has been lifelong. Growing up at the beach and becoming a pro surfer allowed Chris to travel the world. At the peak of Chris’s surfing career he had made it into the finals at the Banzai Pipeline Masters. Barela’s passion for nature is the driving force behind his art …Chris’s talents are not limited to bronze sculptures, he excels at photography and filmmaking and recently was awarded first place in the Hawaii Ocean Film Festival for his short film on octopus. It is without question that Barela has become one of the world's best sculptors/patina artist, which grants him the honor of being one of the most influential artist of today.